The creators of Tao have done it again. This time, their creation is LAVO, a Mediterranean-inspired bathhouse that includes not only its own Mediterranean restaurant, but also one of the hottest nightclubs in Las Vegas. Located inside the Palazzo Resort Hotel Casino, the restaurant is on the first floor of this two-story entertainment concept. 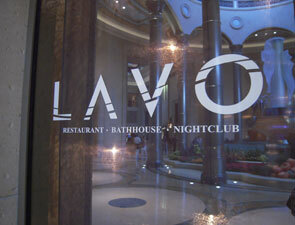 The second-floor nightclub is accessible both from inside the restaurant and also by using a separate VIP elevator. Designed by AvroKo, a high-profile design firm whose designs are showcased in a variety of hospitality venues -- including W Hotels and restaurants like Stanton Social and Quality Meats --. the restaurant takes its inspiration from the bathhouses of ancient Mediterranean culture. In fact, its name, LAVO, is Latin for “to bathe or cleanse.” Still, although the décor is straight from Morrocco -- and even arrived from there on container ships -- the atmosphere is pure Vegas. 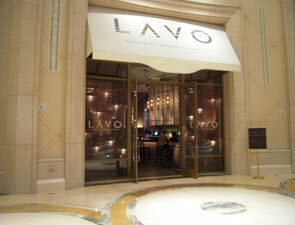 Everyone at LAVO wants you to have fun – to dance, party and celebrate. Because the restaurant and nightclub have the most state-of-the-art sound system in Vegas, doing all of the above is easy. Of course, the bass might make it difficult to “relax and enjoy,” as we like to say at TravelsinTaste.com, but you’ll still find it easy to simply enjoy!